Keratoconus (KC) is the most common ectasia of the cornea and is a common reason for corneal transplant. Therapeutic strategies that can arrest the progression of this disease and modify the underlying pathogenesis are getting more and more popularity among scientists. Cumulating data represent strong evidence of a genetic role in the pathogenesis of KC. Different loci have been identified, and certain mutations have also been mapped for this disease. Moreover, Biophysical properties of the cornea create an appropriate candidate of this tissue for gene therapy. Immune privilege, transparency and ex vivo stability are among these properties. Recent advantage in vectors, besides the ability to modulate the corneal milieu for accepting the target gene for a longer period and fruitful translation, make a big hope for stupendous results reasonable. Purpose: The purpose was to compare transepithelial versus epithelium off technique of corneal collagen crosslinking (CXL) in patients of keratoconus. Materials and Method: Totally, 40 eyes (40 patients) with progressive keratoconus were subjected to transepithelial CXL (20 eyes; Group I), and conventional CXL (20 eyes; Group II). Patients were evaluated for uncorrected distance visual acuity, best corrected visual acuity (BCVA), slit lamp-biomicroscopy, keratometry, 9-point pachymentry, orbscan II, and endothelial cell count at baseline and post CXL at 1, 3, and 6 months. Results: The two groups were similar with respect to the evaluated parameters both at baseline and at the end of 6 months. There was an improvement in mean BCVA from Log Mar 0.327 ± 0.1 (Group 1), 0.36 ± 0.08 (Group 2) to 0.23 ± 0.08 (Group 1; P < 0.001), 0.22 ± 0.06 (Group 2; P < 0.001), respectively, at 6 months. Mean Sim K astigmatism decreased from 6.6 ± 1.93 D (Group 1), 6.64 ± 1.93 D (Group 2) to 5.14 ± 1.86 D (Group 1; P = 0.001), and 4.77 ± 0.06 (Group 2; P = 0.001), respectively, at 6 months. The mean pachymetry increased from 432.05 ± 19.36 μm (Group 1), 429.91 ± 16.66 μm (Group 2) to 447.8 ± 16.09 μm (Group 1; P < 0.001), 440.25 ± 11.18 um (Group 2; P = 0.002), respectively, at 6 months. All cases showed stabilization of keratoconus two eyes in epithelium off group developed persistent stromal haze. 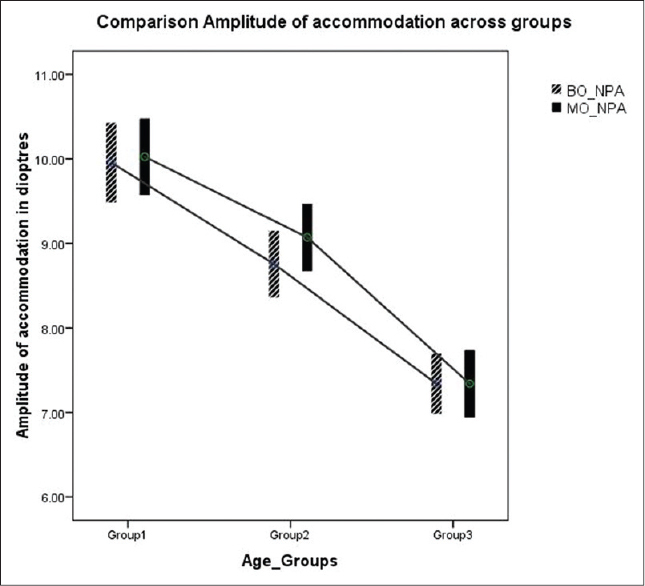 Most of the patients in Group II experienced pain and photophobia during first 2 days, but not of Group I. Conclusion: Trans-epithelial technique offers visual and topographic outcomes similar to the conventional method with superior patient comfort postintervention. Background: Glaucoma and diabetes have a common pathogenesis. We estimated the magnitude and determinants of glaucoma in adults with type II diabetes who presented to a tertiary level eye center in 2010. Study Type: A cross-sectional survey. Methods: Diabetes was diagnosed by history and measurement of blood sugar levels. Glaucoma was diagnosed by assessing optic disc morphology, visual fields, and intraocular pressure. Data were collected on patient demographics, clinical characteristics of diabetes and ocular status through interviews and measurements. The prevalence of glaucoma in diabetics was estimated, and variables were analyzed for an association to glaucoma. The 95% confidence intervals (CIs) were calculated. Statistical significance was indicated by P < 0.05. Results: The study cohort was comprised of 841 diabetics. The mean age of the cohort was 53.8 ± 10.7 years. There were 320 (38%) females. The prevalence of glaucoma was 15.6% (95% CI: 13.1-18.1). More than 75% of the diabetics had no evidence of diabetic retinopathy (DR). Half of the diabetics with glaucoma had primary open angle glaucoma. The presence of glaucoma was significantly associated to the duration of diabetes (Chi-square = 10.1, degree of freedom = 3, P = 0.001). The presence of DR was not significantly associated to the presence of glaucoma (odds ratio [OR] = 1.4 [95% CI: 0.88-1.2]). The duration of diabetes (adjusted OR = 1.03) was an independent predictor of glaucoma in at least one eye. Conclusions: More than one-sixth of diabetics in this study had glaucoma. Opportunistic screening for glaucoma during DR screening results in an acceptable yield of glaucoma cases. Background: To evaluate the results of visual acuity and quality, and corneal integrity in myopic patients with a thin cornea who received photorefractive keratectomy (PRK). Materials and Methods: In this before-after interventional study, 30 myopic eyes with a myopia −3.76 ± 1.72 (−6.50 to −1.25) D and a corneal thickness of 486.03 ± 11.93 (452-499) μm at the thinnest point received PRK. In myopia was more than 4D, mitomycin C was used with PRK. The surgery was performed with an excimer laser (VISX STAR, Abbott Medical Optics, Abbott Park, US). Results: The safety and the efficacy index of the surgery was 1.01 ± 0.05 and 1.00 ± 0.05 in these patients, respectively. All the patients were within ±0.5D of emmetropia 1 year after the surgery. Mesopic contrast sensitivity (CS) had a significant increase in two spatial frequencies of six (P = 0.003) and 12 (P = 0.003). Total coma (P < 0.001), spherical aberration (P < 0.001), and total higher-order aberrations (HOA) (P < 0.001) also showed a significant increase. Corneal hysteresis (P < 0.001) and corneal resistance factor (P < 0.001) showed a significant decrease after 1 year. Conclusion: PRK is a safe, effective, and predictable procedure with desirable effects on mesopic CS in patients with corneal thickness <500 μm, which increases HOAs and decreases corneal integrity proportionate to its value before the procedure. 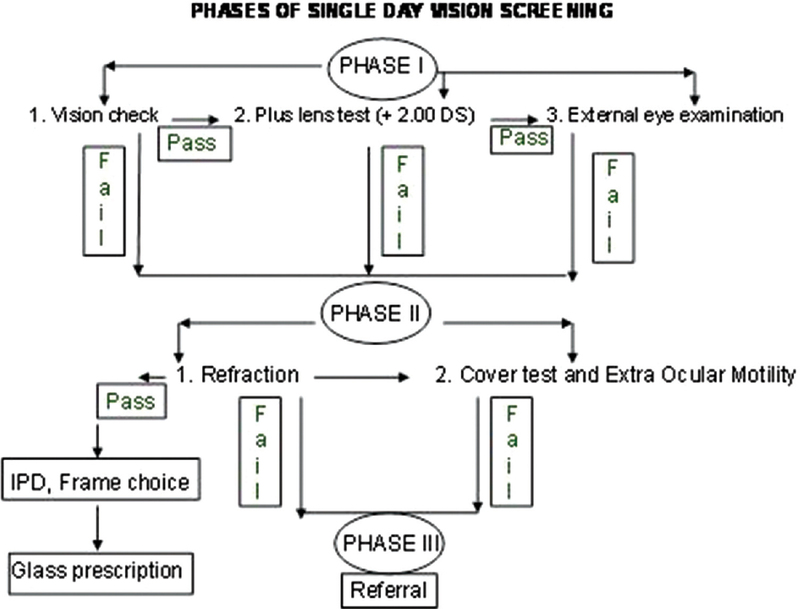 Background: School vision testing aims at identification and management of refractive errors. Large-scale school vision testing using conventional methods is time-consuming and demands a lot of chair time from the eye care professionals. A new strategy involving a school of optometry in single day large scale school vision testing is discussed. Aim: The aim was to describe a new approach of performing vision testing of school children on a large scale in a single day. Materials and Methods: A single day vision testing strategy was implemented wherein 123 members (20 teams comprising optometry students and headed by optometrists) conducted vision testing for children in 51 schools. School vision testing included basic vision screening, refraction, frame measurements, frame choice and referrals for other ocular problems. Results: A total of 12448 children were screened, among whom 420 (3.37%) were identified to have refractive errors. 28 (1.26%) children belonged to the primary, 163 to middle (9.80%), 129 (4.67%) to secondary and 100 (1.73%) to the higher secondary levels of education respectively. 265 (2.12%) children were referred for further evaluation. Conclusion: Single day large scale school vision testing can be adopted by schools of optometry to reach a higher number of children within a short span. Purpose: Early presentation of rejection facilitates early initiation of treatment which can favor a reversible rejection and better outcome. We analyzed the incidence, clinical features including rejection-treatment period and outcomes following graft rejection in our series of pediatric corneal graft. Materials and Methods: Case records of pediatric penetrating keratoplasty (PK) were reviewed retrospectively, and parameters noted demographic profile, indication of surgery, surgery-rejection period, rejection-treatment interval, graft outcome, and complications. Results: PK was performed in 66 eyes of 66 children <12 years, with an average follow-up of 21.12 ± 11.36 months (range 4-48 month). The median age at the time of surgery was 4.0 years (range 2 months to 12 years). Most of the children belonged to rural background. 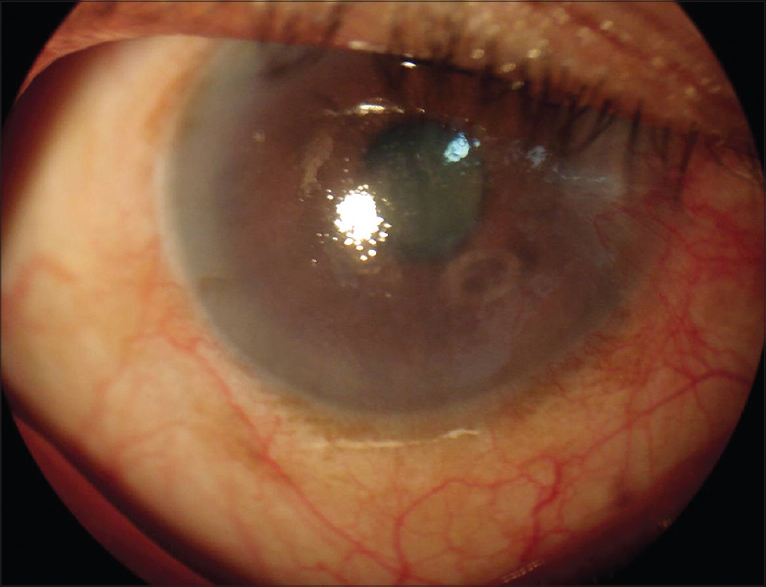 Scarring after keratitis (22, 33.4%) was the most common indication. Graft rejection occurred in eight eyes (12.12%) (acquired nontraumatic - 3, congenital hereditary endothelial dystrophy [CHED] - 2, nonCHED - 1, congenital glaucoma - 1, regraft - 1). The mean surgery-rejection period was 10.5 ± 7.3 months and mean rejection-treatment interval was 10.9 ± 7.02 days. Conclusion: This study showed irreversible graft rejection was the leading cause of graft failure of pediatric PK. Though, the incidence (12.1%) of graft rejection in current study was not high, but the percentage of reversal (25%) was one of the lowest in literature because of delayed presentation and longer interval between corneal graft rejection and treatment. In addition, categorization of the type of graft rejection was very difficult and cumbersome in pediatric patients. Background: To evaluate the visual and refractive outcomes of cataract surgery with toric intraocular lens (IOL) implantation at a teaching hospital of the United Kingdom. Design: Prospective interventional case series. Materials and Methods: This study compared the outcome of 3 groups of patients: Group 1 included 25 eyes with cataract and more than 2.5 diopters (D) of corneal astigmatism receiving a toric monofocal IOL; Group 2 had 18 patients with cataract and more than 2.5 D of astigmatism but receiving a non-toric monofocal IOL; while Group 3 had 25 patients with cataract and less than 1.5 D of astigmatism and receiving a non-toric monofocal IOL. Data collected included uncorrected (UDVA) and corrected (CDVA) distance visual acuities, refraction and corneal keratometry. Postoperative examinations were scheduled at 1 and 6 weeks. Results: Postoperatively the mean UDVA was LogMAR 0.27 ± 0.20 (equivalent snellen acuity of 20/37) in Group 1, 0.54 ± 0.22 (20/69) in Group 2 and 0.16 ± 0.20 (20/29) in Group 3. The mean CDVA was LogMAR 0.08 ± 0.13 (20/24) in Group 1, 0.23 ± 0.16 (20/34) in Group 2 and 0.04 ± 0.13 in Group 3 (20/22). The mean preoperative keratometric cylinder was 3.78 ± 1.0 D in Group 1, 3.41 ± 1.47 D in Group 2 and 0.97 ± 0.43D in Group 3; the mean postoperative subjective cylinder was 1.2 ± 0.68 D in Group 1, 3.23 ± 1.41 D in Group 2 and 0.95 ± 0.58 D in Group 3. 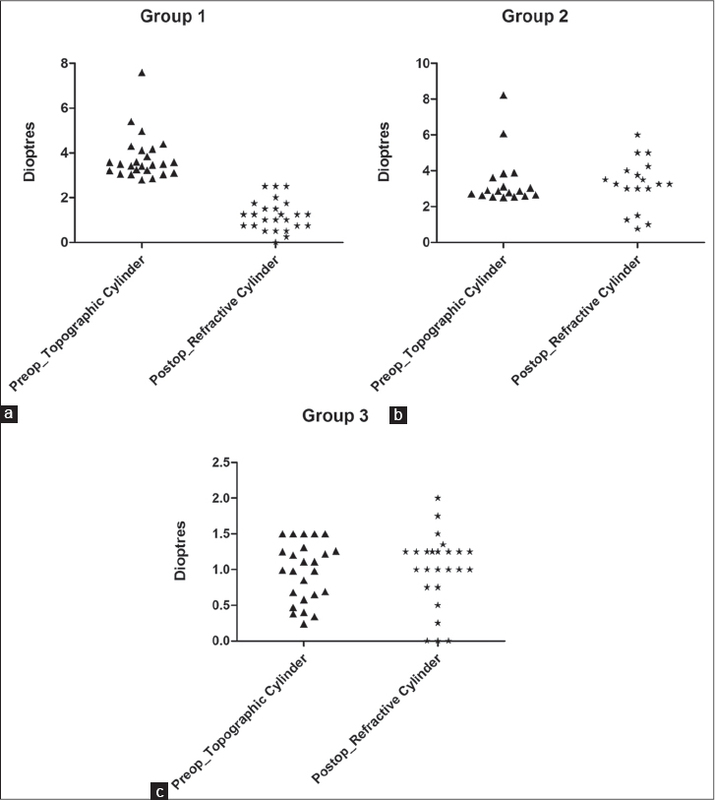 The difference was statistically significant for the postoperative refractive cylinder values when comparing Group 1 to Group 2 (P = <0.0001) but the difference was insignificant between Group 1 and Group 3 (P = 0.23). 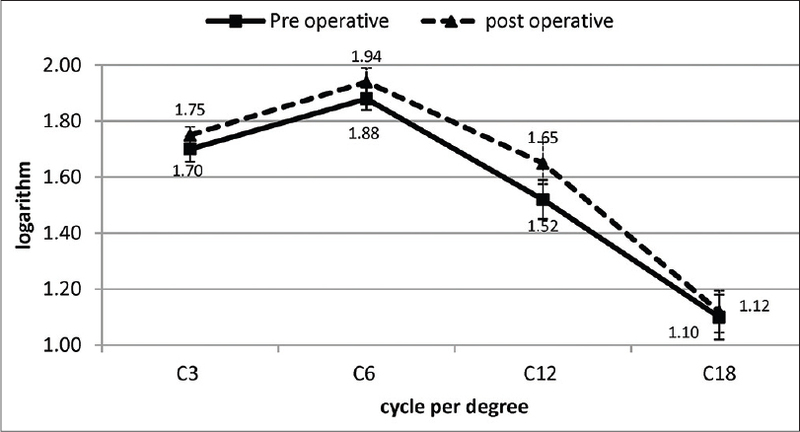 Conclusion: Toric IOL implantation is an effective option to manage corneal astigmatism at the time of cataract surgery and to optimise visual outcomes for astigmatic patients when comparing to outcomes for their non-astigmatic counterparts. Cat scratch disease is a febrile illness caused by Bartonella henselae and is associated with rash at the site of cat bite or scratch and regional lymphadenopathy. Various ocular manifestations of cat scratch disease have been described, mainly retinochoroiditis, optic disc swelling, neuroretinitis, vascular occlusive events, serous retinal detachment, vitreous hemorrhage, intermediate uveitis, inflammatory lesions of the optic nerve head and rarely full thickness macular hole. 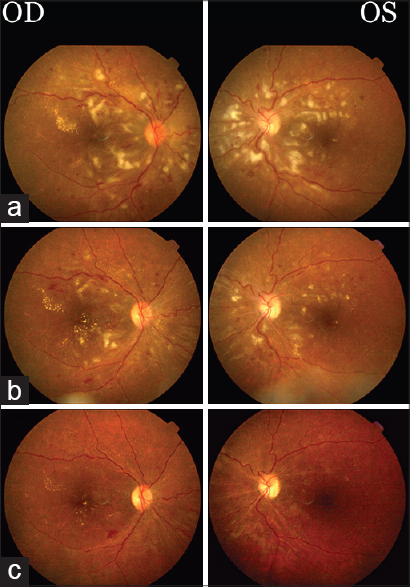 We describe a case of an 11-year-old girl who presented 2 weeks after the onset of symptoms, with B. Henselae neuroretinitis with full thickness macular hole at presentation. A 21-year-old female patient presented with gradual progressive loss of vision in both eyes of 12 years duration. 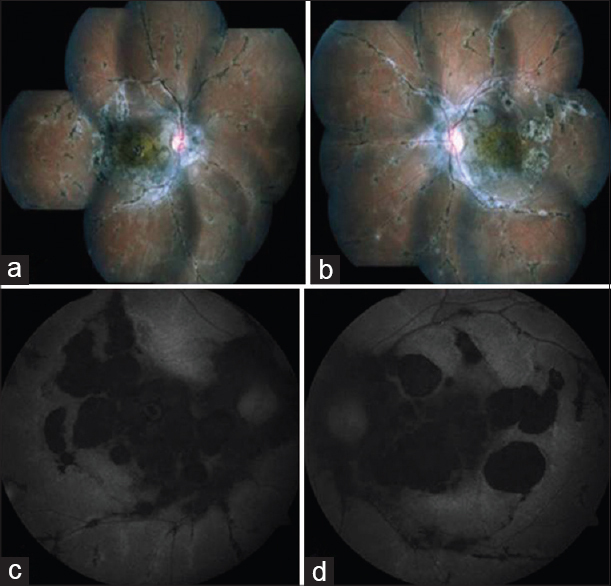 Funduscopic examination revealed bone-spicule pigmentation and choroidal and retinal pigment epithelium atrophy along the vascular arcades, with macular involvement in both eyes. The patient was diagnosed with pigmented paravenous retinochoroidal atrophy which is rare disease, uncommon in females, more commonly affecting the paravascular fundus. Very few cases of macular involvement have been reported. We report a rare case of anterior chamber live dirofilariasis presenting as anterior uveitis. 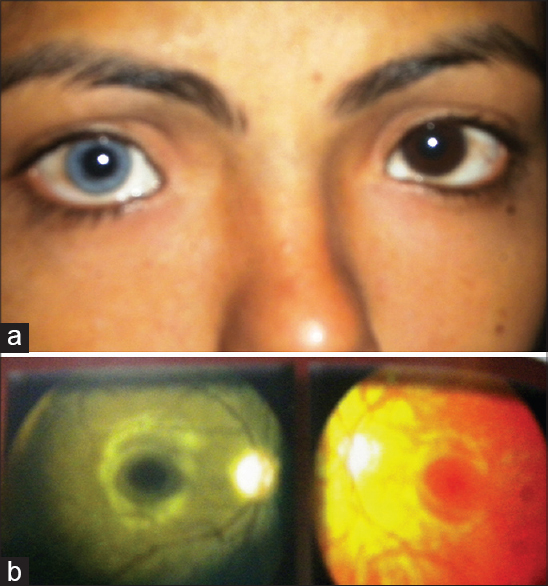 A 60-year-old man presented with dimness of vision in the right eye for 1 month. Vision recorded was 6/18 P, N 18 in the right eye. Slit lamp examination of the right eye revealed anterior uveitis with a moving nemathelminthes. The worm was removed live from the anterior chamber under local anesthesia with assisted methyl cellulose delivery and post-operatively, the worm was examined directly under light microscope. Morphometric measurement showed length of the worm was 6.061 mm. A thin, pale, slender worm was diagnosed as immature female Dirofilaria repens and was documented completely. Patient had made an excellent recovery of vision and intraocular inflammation after the surgical removal of the worm. Intraocular infection of dirofilaria is a rare presentation and successful surgical removal of the worm resulted in complete recovery of uveitis and visual status in the affected eye. We report a case of a 45-year-old female, who was diagnosed as Behcet's disease and presented to us with nodular scleritis in her right eye. 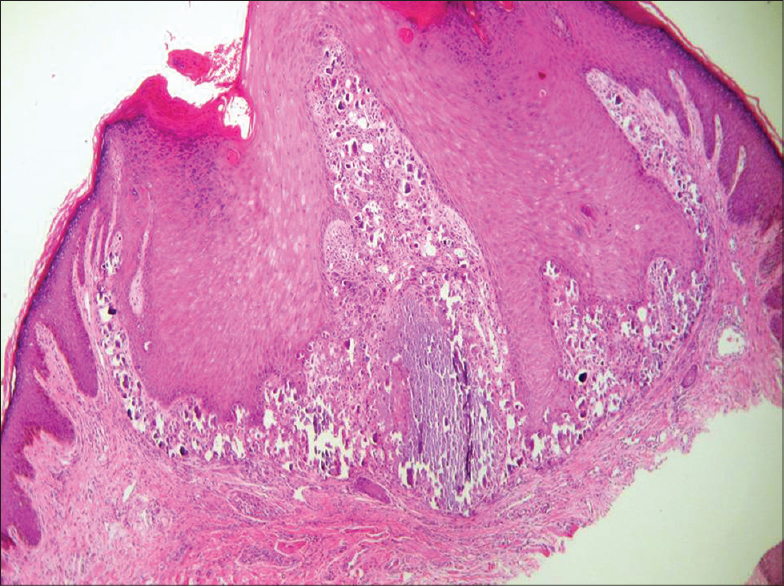 Calcinosis cutis involves the inappropriate deposition of calcium within the dermis layer of the skin and is often associated with autoimmune diseases. 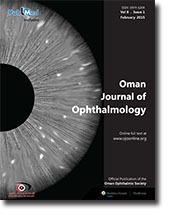 A 3-year-old healthy Omani child presented for evaluation of asymptomatic hard nodule on the left upper eyelid. Pathological examination identified the mass as subepidermal calcified nodule. 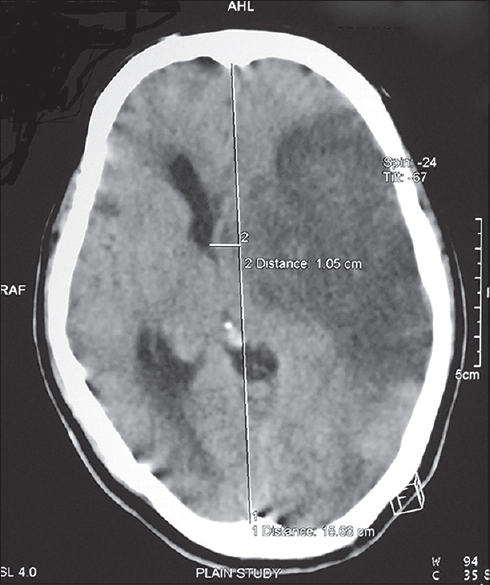 The patient had no history of trauma or metabolic disturbances. Serum levels of calcium and phosphate were normal. 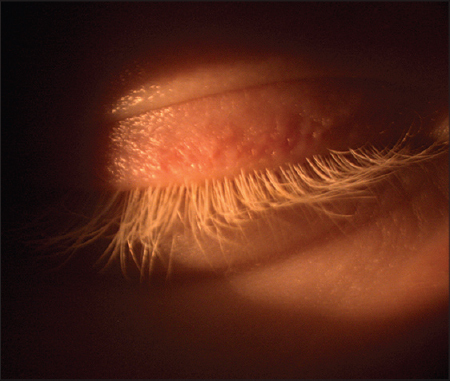 Idiopathic calcinosis cutis should be included in the differential diagnosis for eye lid mass. Choriovitreal ingrowth of a large choroidal vessel is a known complication of intense focal retinal laser photocoagulation. With a standard grey-white burn in panretinal photocoagulation where the power density used is low, such an invasion is rarely reported. 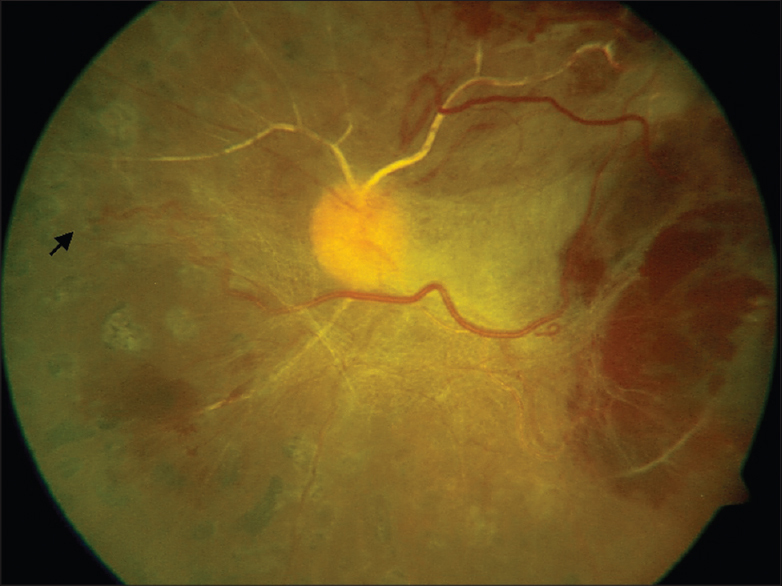 We came across the complication in a clinical scenario where a patient with proliferative diabetic retinopathy and associated ocular ischemic syndrome developed the neovascular ingrowth after scatter retinal photocoagulation. Signs of hypertensive retinopathy are common and are correlated with elevated blood pressure. Patients who have swelling of both optic discs and very high blood pressure (i.e., malignant retinopathy) need urgent antihypertensive treatment. A patient was reported with malignant hypertensive retinopathy who recovered promptly following single intravitreal bevacizumab injection. Intravitreal bevacizumab (1.25 mg/0.05 mL) was injected in two eyes of a patient having malignant hypertensive retinopathy with optic disc edema, macular edema, and retinal exudates. A complete ophthalmic examination, including the best-corrected visual acuity (BCVA), central macular thickness on optical coherence tomography (OCT), and fluorescein angiography (FAG), was performed before and after the treatments. Two eyes in a patient received a single intravitreal injection of bevacizumab had improvement of macular edema on OCT at 1 month and decreased fluorescein leakage on FAG 3 months after the treatment, which led to improvements in the BCVA both eyes. The results suggest that intravitreal bevacizumab injections might be a useful and safe adjunctive treatment of malignant hypertensive retinopathy, in addition to proper medical management of malignant hypertension. A previously healthy six year old male child presented in pediatrics ICU in state of shock with history of fever and rashes and later was diagnosed as chicken pox. He developed right sided periorbital varicella gangrenosa which is a form of necrotizing fasciitis secondary to skin infection. Patient was treated with intravenous acyclovir, antibiotics, amphotericin B, extensive debridement and later reconstruction of upper eyelid with skin grafting. Aggressive treatment helped preventing the eyeball and orbital involvement which would have necessitated orbital exenteration. However delayed presentation resulted in necrosis of orbicularis oculi and underlying tissue which resulted in graft retraction and lid dysfunction. Clinicians should be aware of this rare but fulminating condition to minimise the sight and life threatening complications associated with it. A 32-year old male hairdresser presented with redness and irritation of the left eye for past 15 days. 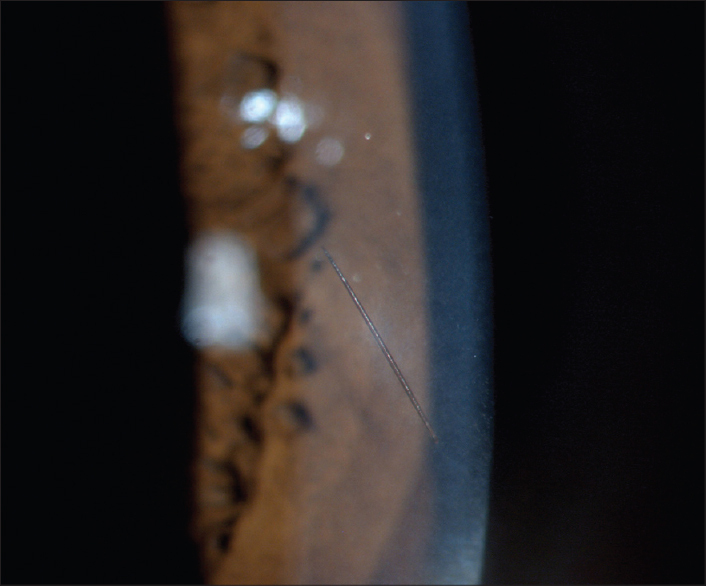 A fragment of hair was found embedded in deep corneal stroma with minimal scarring. No evidence was found of previous or current inflammation incited by this foreign body. The position and depth of the hair fragment was documented by anterior segment optical coherence tomography (AS-OCT) and its effect on the corneal endothelium was assessed by specular microscopy. Hairdressers should take adequate precautions to prevent ocular injury although human hair appears to be well tolerated by the cornea. 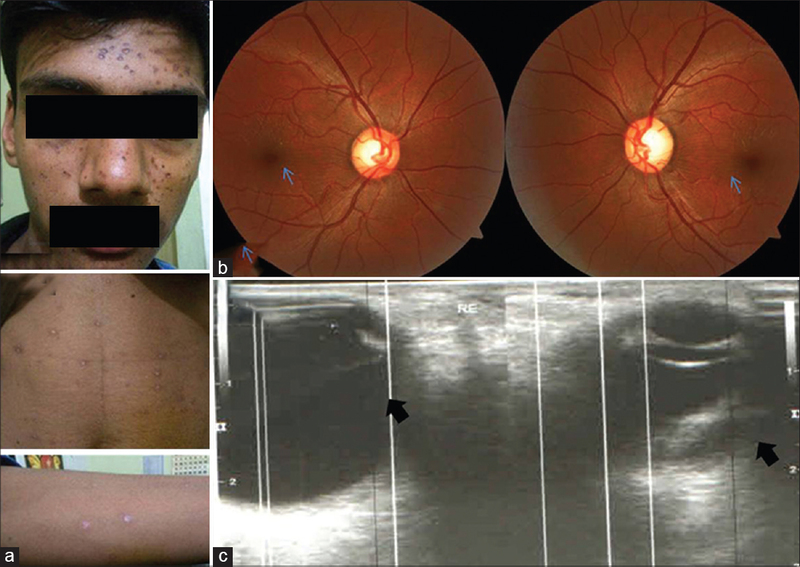 A 13 year old boy presented with sudden onset of painless blurring of vision in his both eye, twenty days following varicella infection. Ocular examination revealed -3.00 DS refractive error; and cilio-choroidal effusion. 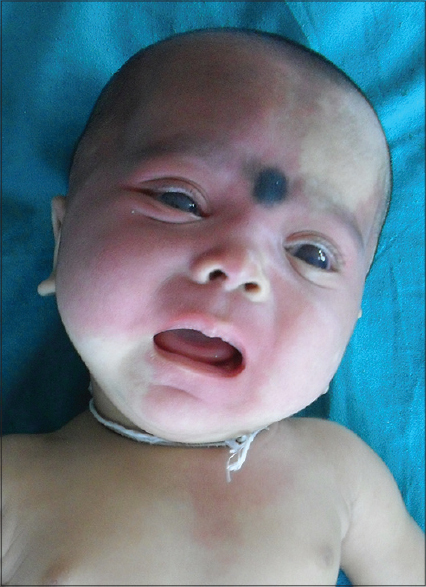 After treatment at 1 months he had unaided 6/6; N-6 vision in both eyes. We describe two cases of acute retinal necrosis (ARN) in a post renal transplant diabetic patient and a pregnant female in the first trimester. Serial ultra wide field imaging (UWFI) with comprehensive ocular examination was done to monitor the progression of the disease. All the cases responded favorably with intravenous followed by oral acyclovir, which was captured with UWFI. UWFI provides objective proof of response to therapy in ARN. 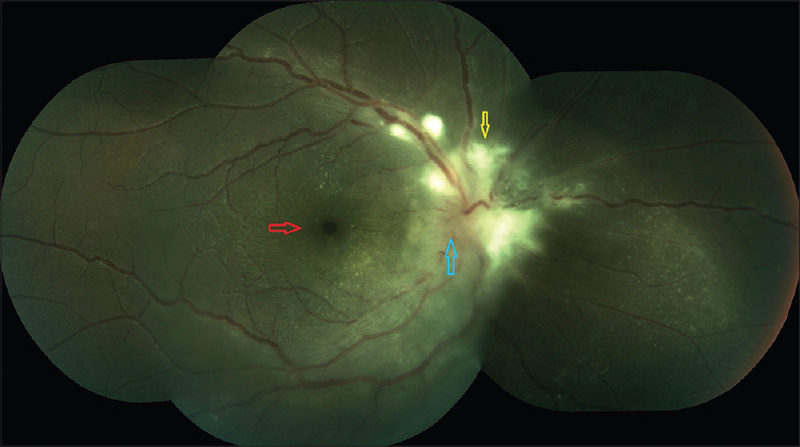 UWFI may also improve patient education and counseling for this peripheral retinal disorder.